Yes! it was an indulgence day at Red Lobster Malaysia with seafood galore especially lobsters. As we know that Red Lobster is one of America’s favourite and the world’s largest seafood restaurant chain is now in Malaysia and it is also their first restaurant in South East Asia. Savor the freshness and variety of Live Maine or Live Rock Lobsters, Snow Crab Legs, Shrimps, Scallops, Salmon and more. At Red Lobsters we can choose how we like our seafood to be cooked either, grilled, baked, blackened or steamed. There are a few signature dishes that we tried on that day… let’s start! Cheddar Bay Biscuits is complimentary with every meal. It is served fresh, hot and fluffy. Quite like the biscuits compared to the usual bread. I kicked start lunch with lobster pizza, it is a crispy thin pizza topped with maine lobster meat, mozzarella cheese, fresh tomatoes and sweet basil. I like the crispy pizza and the lobster meat great for sharing. The dipped in batter and coconut flakes then fried to golden brown, served with pina colada sauce. Well, it’s crispy on the outside and quite juicy inside. The batter taste a bit sweet and the sauce is creamy and slightly tangy. Must Try! The Lobster Bisque is my favourite. The creamy savoury soup with quite generous of lobster bits in it. If you like a rich and strong lobster taste, you will like this soup. I wish that I could have a bowl of Lobster Bisque soup on a rainy day. Cream based chowder made with clams and potatoes. The New England Clam Chowder soup has lighter flavour. I prefer the Lobster Bisque soup that this. Bar Harbor Lobster Bake is quite big portion and for sharing. I like the combination of whole seafood and pasta; roasted split lobster tail, tender shrimps, sea scallops, mussels and linguini in savory thick seafood broth. Snow Crab Legs, tender shrimps and bay scallops roasted in garlic and special broth served with potato wedges. This dish is moderate only. The crab legs are slightly salty for me. Other than that the rest of it are alright. The potato wedges are quite good dipped in the lobster bisque soup. A Maine lobster tailm, skewered shrimp and wild caught sea scallops with buttery garlic finish over wild pilaf rice and some broccoli at the side. This is slightly more Asian. The skewered scallops are fresh and succulent. Portion is moderate. Those who can eat beef you get the best of both meat & seafood in this dish. The tender juicy beef burger patty with grilled maine lobster and French fries. You can choose the steak to be cooked in the way that you like rare, medium rare, medium well or well done. Double Chocolate Torte is awesome, so moist and rich in chocolate. The Cheese Cake quite standard. I prefer the chocolate torte more. Red Lobster in Malaysia is operated by the local Secret Recipe F&B Group, they are renowned for their award-wining cakes and fusion delights. 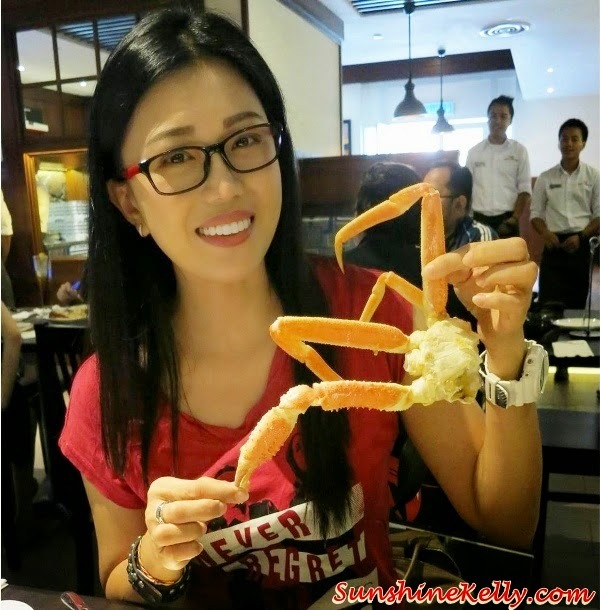 Overall, I like the freshness of the seafood at Red Lobster Malaysia. Their cooking method is quite simple either baked, grilled, steamed or blackened without sauces on it, still preserved the original freshness taste of the seafood which I think is very important. The restaurant environment is quite simple, clean and neat yet cozy. The front is more like a family style restaurant and towards the back they have a bar and more chill out mood for happy hour. The menu starts from RM9.90 onwards for soups, salads and starters; RM26.90 onwards for main entrees and RM32.90 onwards for Signature Seafood Combinations. There will be more Red Lobster restaurants opening in Malaysia such at Gamuda Walk Mall in Shah Alam and Quill City Mall Kuala Lumpur. wow..everything about Lobster...I'm drooling all over..must go!